Stand Up Paddle Boarding (SUP) exploded onto the scene in the Truckee-Tahoe region a few years ago and has gained in popularity ever since. This human powered sport is a great way for athletes of all ages and abilities to get out on the pristine lakes of the High Sierra. 2. Donner Lake: Often referred to as Lake Tahoe’s little sister, Donner Lake is located within the Truckee town limits and is the perfect place for beginner paddle boarders to dip their toes in the water. The lake is lined with 35 docks that are free and open for public use as well as state and town owned beaches on either end. Donner Lake also boasts a calm lagoon called China Cove which is perfect for paddle board yoga or experimentation with the sport. Donner Lake tends to get a bit choppy in the afternoon so plan a morning paddle for a serene experience. 3. DL Bliss State Park, Lake Tahoe: This state park is located on the West Shore of Lake Tahoe and is the perfect jumping off point for multiple paddles. Paddle north to nearby Meeks Bay for lunch at their snack bar or for a more advanced day-long paddle set out to for the iconic waters of Emerald Bay directly south of D.L. Bliss. Once you enter the mouth of the Bay you can paddle your way around the famous tea house island. This is popular location for boaters and large paddle boats filled with tourists, so only the most confident SUP enthusiasts should take on Emerald Bay’s boat wakes. 4. Prosser Creek Reservoir: Located just three miles northeast of downtown Truckee, there are excellent paddling opportunities around the eleven miles of shore line at Prosser Creek Reservoir. A 10 mph speed limit keeps this reservoir calm and wave free even in the height of summer. Bald eagles can often be viewed nesting in the tall sugar pines that line this placid body of water. 5. Sand Harbor, Lake Tahoe: Sand Harbor State Park offers access to the undeveloped side of Lake Tahoe. Tahoe’s East Shore coastline offers picturesque emerald green waters and unique geology. You can paddle past the historic Thunderbird Lodge and secluded hike-in beaches. 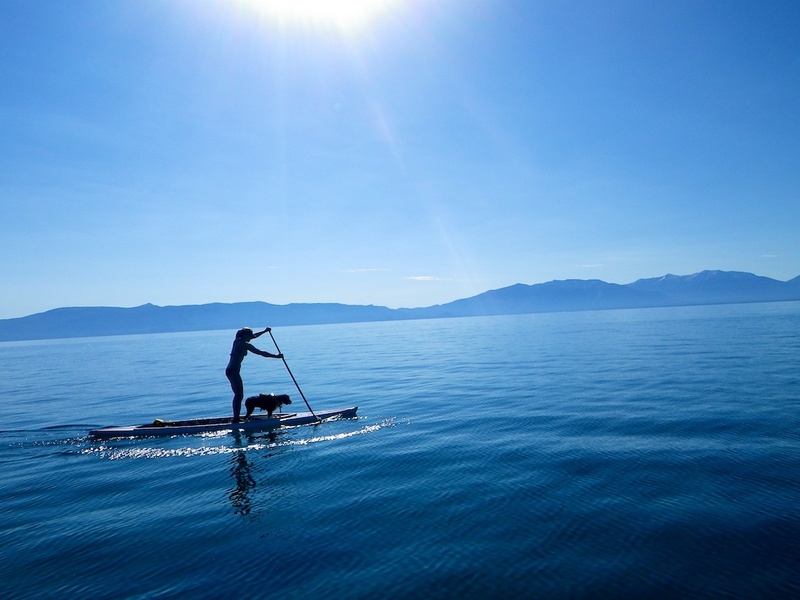 This area is of Lake Tahoe is perfect for exploration from the water and Paddle Boarding is a great way to see the hidden treasures of the East Shore. There are many great local business where you can rent SUP. 5th day FREE on Multi-day Rentals.